Since it's quite late already and I have to go to sleep early today, to prepare myself for my first day of work, there won't be to much writing today. Yesterday evening, my parents and I went to eat cheese fondue. oh!!!! And it tasted sooooo good!!! Heaven on earth! It's made of two kinds of cheese with cherry brandy - to die for! Unbelievable taste experience! Current view from my room. I have to share this room with an other girl (Heather from Wisconsin, as I've already told you) for two days, since my single room is still occupied till tomorrow. So tomorrow morning I finally move to my real room! Yey!!! floor infront of my room. You can see the showers and the bathroom. Small kitchen on my floor. This accomondation is very very clean and tidy - I like ;-)! And it lies in the heart of the city! Just next to the church St. Pierre - so the oldest part of Geneva. You cannot live closer to downtown than I do. and right next to it, my accomondation "home St. Pierre - Petershöfli". Just go down the hill and you are in the main shopping street of Geneva! with a great view over the lake of Geneva. An artist downtown. How does he manage to sit in the air for so long?! 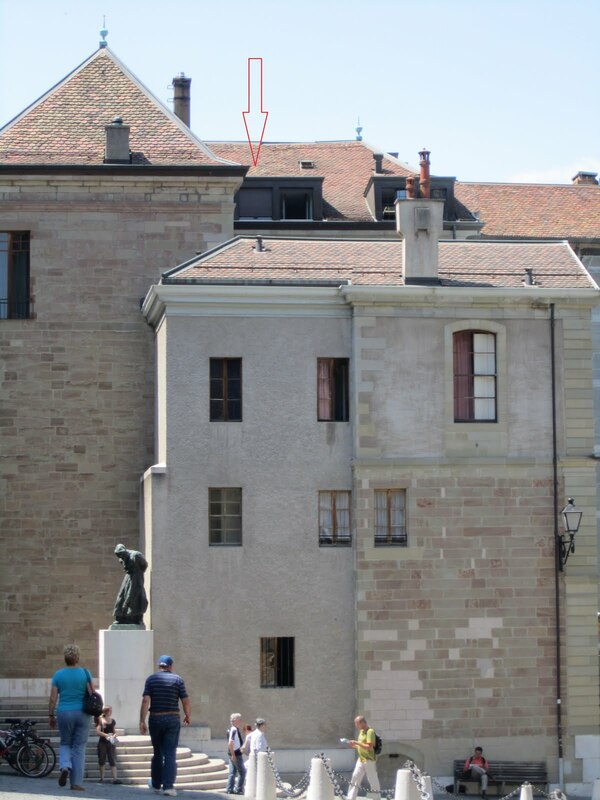 A monument for the Protestant Reformation at the University of Geneva, where you also find a statue of Calvin. My current room from the outside (arrow). Some turkey - rice stuff. Yummie! And this is the place I'm gonna start working tomorrow - ILO!